Prior to European colonization, vast wild rice beds were found along some of the Great Lakes shorelines and smaller beds on Michigan’s inland lakes and streams. Drastic changes to the landscape resulted in the complete loss of our largest beds and a serious decline in the remaining inland beds. Wild rice is recognized as an important part of Michigan’s ecological landscape and history. This presentation will introduce the audience to wild rice, historical impacts, and present-day efforts to conserve and protect it. Barb Barton wears many hats. She describes herself as an earth muffin who works to connect people to each other and to the Earth. Barb is the Aquatic Resource Specialist for the MDOT, and is also a wild foods forager, singer/songwriter, and author. 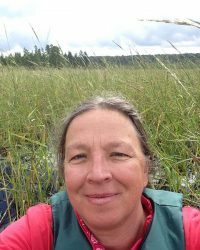 Her recent book, Manoomin: The Story of Wild Rice in Michigan, earned a 2018 State History Award. She was also awarded the 2009 MSU Extension Diversity Award for her work with the Michigan tribes on Manoomin. Barb can be found lurking in the wilds of Lansing. Roger LaBine is an enrolled member of the Lac Vieux Desert Band of Lake Superior Chippewa. Roger is a Water Resource Technician in the tribes Environmental Department, one of his responsibilities is Manoomin Restoration to the tribes ceded territory in addition to his water quality monitoring. He was inspired by his mentor and uncle who had a vision of Manoomin returning to the traditional lands and has over 35 years of experience. 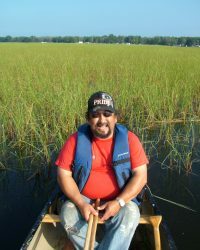 He enjoys visiting tribal communities, schools, colleges, and conducts Wild Rice Camps to share the cultural, spiritual, ceremonial, and traditional importance of Manoomin. Roger has personal goals when it comes to conservation, protection, restoration, and management of the limited resource in Michigan for present and future generations.